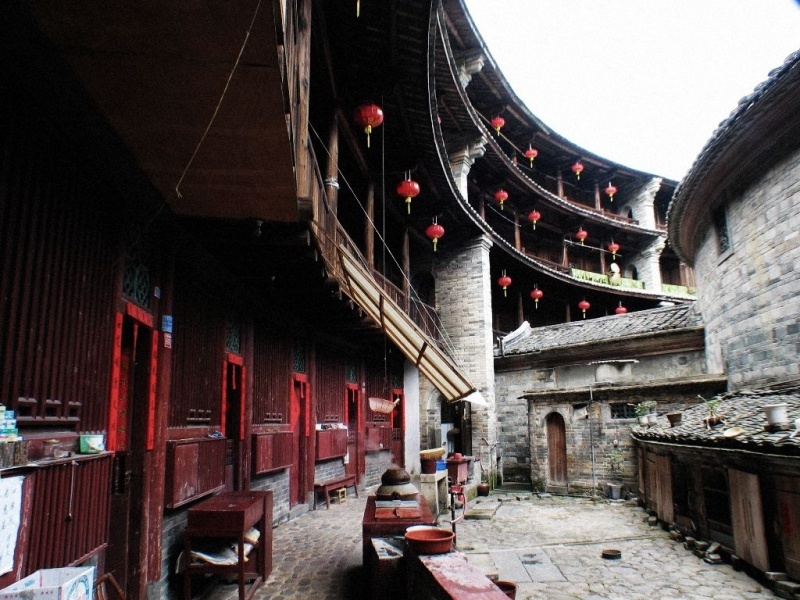 In past there has been a tradition for the extended families of South East China to live together and there are good grounds for this tradition. Clan cohesion was a important factor in the controlling of all activities - political, religious and economical. 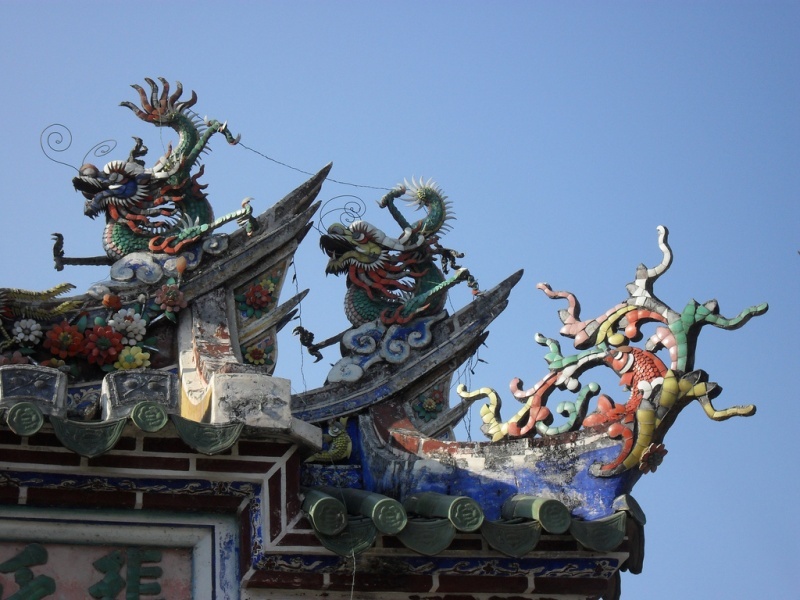 This cohesion meant greater stability for the clan and the individual. (Fei Xiaotong: "Xiangtu Zhongguo - From the Soil", California, 1947/94, page 83). 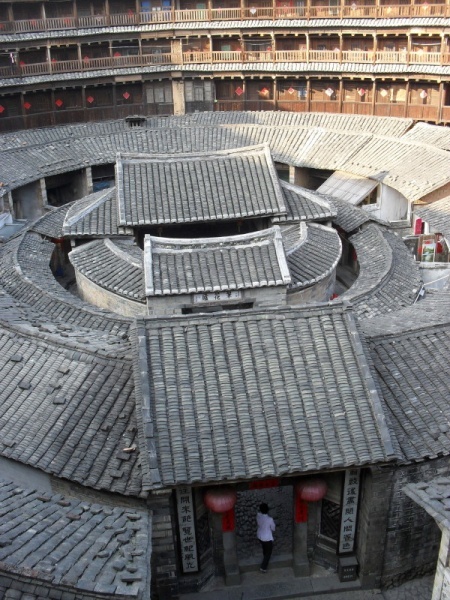 For many years it was believed that the Hakka were the first to build tulou, as a direct consequence of their traditions and way of life. 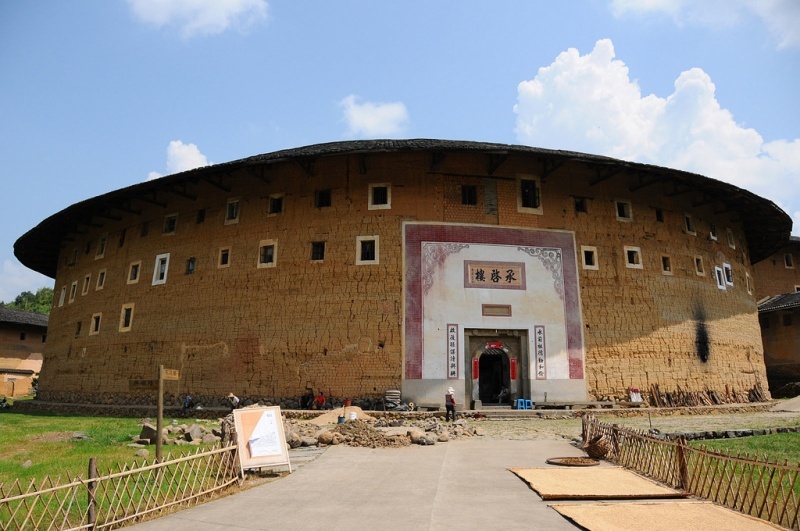 But there is now evidence of the existence of the tulou from before the arrival of the Hakka and regards the circula tulou, most are today inhabited by other, South Chinese, ethnic groups. 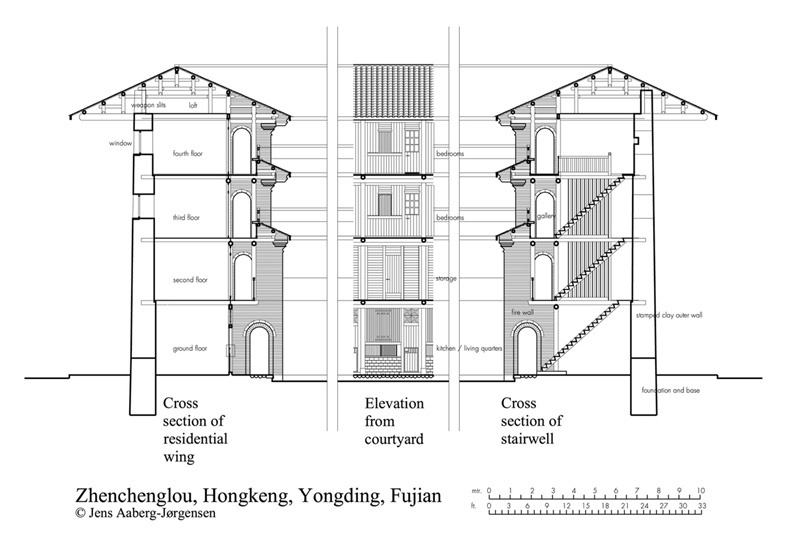 (Huang Hanmin in: Lao Fangzi Fujian Minju,"Nanjing 1994, p. 5 and 24). is of large rounded stones from the local river, filled out with smaller stone. In this frost-free region the foundation's function is purely to support the weight of the building. normally 60-90 centimetres high, is also of large stones, the largest of which are placed at the core of the wall. Both sides are plastered with clay. The terre pisé technique, labour-intensive but cheap, is widespread in China. The erection of such high walls requires fine sedimentary mud from the rice fields, the very same mud that makes for a rich and productive agriculture. We are in the impassable Wuyi mountains of the province of Fujian in South Eastern China, 7 or 8 hours' drive from the cityof Xiamen. which lies on Taiwan strait. On the coast the land is flat and arid while further inland the landscape becomes more hilly and fertile, with banana plantations appearing. 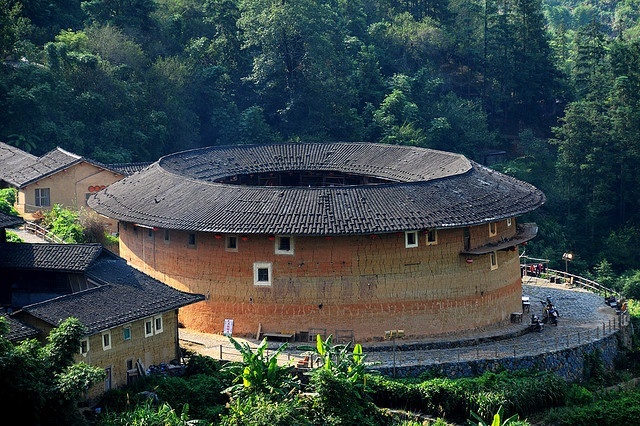 The hills become mountains, and here, nested in the mountain valleys we find these extraordinaryclanhomes, the Tulou. 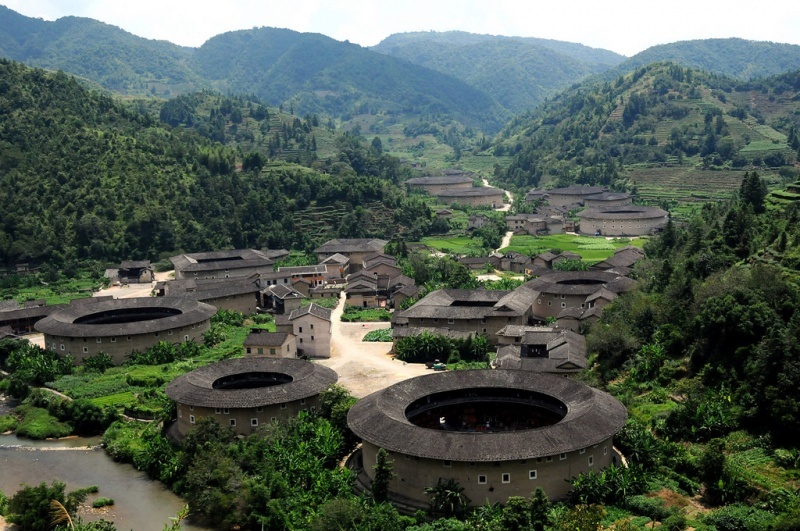 Tulou, meaning earth building, is the most extraordinary type of Chinese Hakka's rural dwelinngs in the mountainous areas of Fujian, in south China. An Energy Efficient Retreat in Texas.